If you’re looking for the best quality, most uniquely designed, and toughest custom Light Up Sabers available anywhere, then you’ve come to the right place! Advanced Light props are beautifully handcrafted pieces of functional Science Fiction and Fantasy artwork. Whether you plan to use your saber as a collectable, cosplay prop, everyday use prop, or film prop, Advanced Light is the way to go. 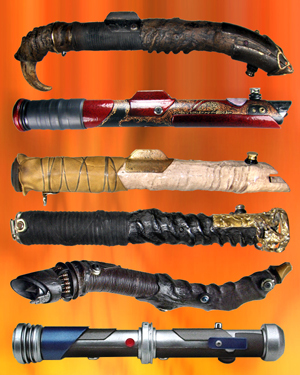 I produce a wide array of sabers, each one created with an incredible attention to detail and function. You will love what I can make for you. Work with me on your own design, or pick up something amazing from my stores. Although I primarily make custom sabers, I make items for my Ebay store. When I have the time to make artwork for the store, it goes up. So, please feel free to check on in to see if there’s anything currently available. Thanks! To see my durability test videos, check out the Blog page. Here’s a spot from Popular Mechanics Online that featured my sabers in action.